International detachable power supply cord. IEC 60309 6H 20 ampere 250 volt (UL/CSA) 16 ampere 230 volt (European) 2 pole + earth plug. SJT 105C H05VV-F, 14 AWG x 3 (1.5 mm x 3) Black cordage. Overall length 2.5 meters. Rated 16 ampere 230 volt. 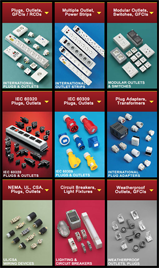 Various terminals and custom stripping are available. Custom lengths are available. 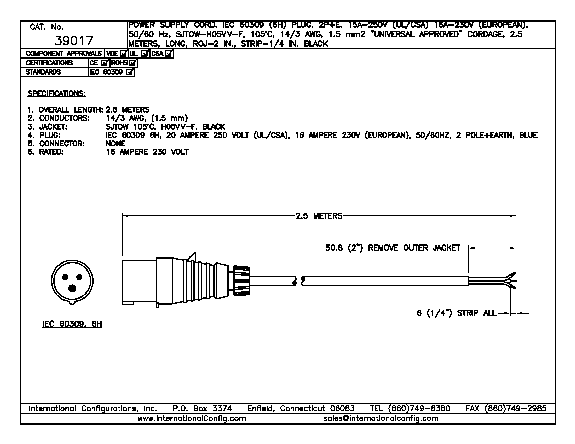 IEC 60320 C-15 120 C type connector available on some models.